Wicked Garden started out in 2010 specializing in the five most influential grunge bands of all time, Nirvana, Pearl Jam, Alice In Chains, Soundgarden, and Stone Temple Pilots. After amassing over three hours of set list hits from these five chart topping bands, they have performed these songs all over Minnesota and surrounding states. In late 2014 and early 2015, two founding members moved on from Wicked Garden to pursue more family time and other interests. John Gensmer, Ryan Gaskill, and Jamie Norman joined up with Wally and Jeff Borgan to form a new lineup with more versatility. After listening to the requests at several shows prior, the newly revamped band decided to expand the set list to include several other artists from the 90′s Grunge Era, as well as Grunge influenced artists that are chart topping today, such as Tool, Foo Fighters, Queens of The Stone Age, etc. The goal of today’s Wicked Garden is to appeal to today’s generation of concert goers, as well as fans of the 90′s era, which is certain to grow the fanbase to a level that was unreachable by sticking to the limitations of the original five band plan. The band wants fans to be able to expect new songs when they see Wicked Garden return to their favorite venue. The goal is to have an extensive catalog to keep the shows fresh, and to keep fans engaged and excited for what may come next time around. For the venues that the band performs back to back nights, the band will have a different set for each night to keep fans coming back for more the second night. Former Blood Root Mother front man has has 10+ years on the road music experience as a vocalist/multi-instrumentalist. A versatile musician, he has performed with everything from regional cover bands, to local original acts. During this time he put out 4 studio releases which included writing collaborations with multi-platinum recording artists, and even a rock and roll hall of famer. After over 1000 career shows and a lust for grunge music, he’s ready to take the stage with Wicked Garden to attempt to emulate his biggest influences. Ryan’s vocal coaching and accuracy has also brought the rest of Wicked Garden’s backing vocal participants’ abilities to a whole new level. Jamie has been performing in original and cover bands for 20 years. Early on, John Gensmer and Jamie formed the drivetrain of an original Minneapolis outfit, Acadian, playing local venues and recording with top local producers. From there, Jamie contributed to other Minneapolis projects before moving on to cover bands on the East Coast and back to Minnesota. Most recently, Jamie has been playing bass in a genre-busting cover trio before tending to guitar duties in Wicked Garden. Jamie provides something to the band that was missing before; a third vocalist to enhance all the harmonies that are needed when covering these great bands, and his attention to detail is second to none. John Gensmer is a Minnesota native with an eclectic background in music and drumming. Known for his hard work and dedication to his craft and his unwillingness to sacrifice quality in a performance, he is a go-to choice for fill-in work and was the first choice to replace Dave Johnson after Dave announced his retirement from Wicked Garden. John previously toured professionally with Metal Blade recording artists, Epicurean, and Century Media recording artists, Warbringer. Jeff has over 25 years of playing bass guitar under his belt. Early on, he was a member of the Twin Cities local heavy metal band Avalanche with his brother Wally (current Wicked Garden Lead Guitarist). Avalanche has had success gigging locally, as well as a CD release in 1996 that featured songs that were high on the metal radio charts in Europe alongside well known world touring artists, as well as getting rave reviews in China and Japan magazine write ups. He now lays down the heavy bass lines that are critical to the 90′s-today grunge and grunge influenced artists’ sound, and works diligently to ensure that accuracy is achieved. Wally has been playing guitar for over 30 years, and enjoyed the same success as his brother Jeff in their band Avalanche as listed in Jeff’s bio. 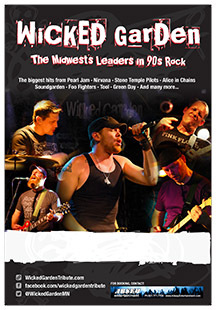 Wally has also performed in the very successful Midwest tribute band T/N/T, A Tribute To AC/DC for eight years covering the legendary guitar work of Angus Young while touring several states. He also is a current member of one of Minnesota’s most highly toured Hard Rock/Heavy Metal bands, The Regime, which has released 3 albums, toured nationally, and is considered one of the best metal artist to originate from Minnesota. Wally’s goal when covering the lead guitar work of all the artists that Wicked Garden covers, is that fans are getting a performance that is on par with the guitarists who wrote the songs.